When You Look At the Future of Your Business, What Do You See? A limited number of private consulting days with me are now available for successful entrepreneurs who are looking to win bigger. Our work together will extend for a full day. The focus of our work will be on moving your business forward in major ways. This will mean digging deep into you as a person and also uncovering opportunities for growth in your business you are either not able to see or have not fully realized. The work might be tactical, including redesigning your client or patient attraction systems. The work might be at a much deeper level, including giving clarity and direction to the future of your business. You could kind of think of me as a cross between a modern day spiritual seeker and a straight up business man. Kind of an odd mix, I’ll grant you that. What I am not, however, is a “guru” of any kind. I am a teacher who will never stop being a student. There is no set curriculum for the day because it will be 100% customized based on you. The fee for the day is $5,500. Reservations are by application only. To check availability, please submit your application using the form below. Provided we are a good fit, we will schedule a short phone call to discuss your goals prior to reserving your consulting day. A $2,000 deposit is required to secure your consulting day. 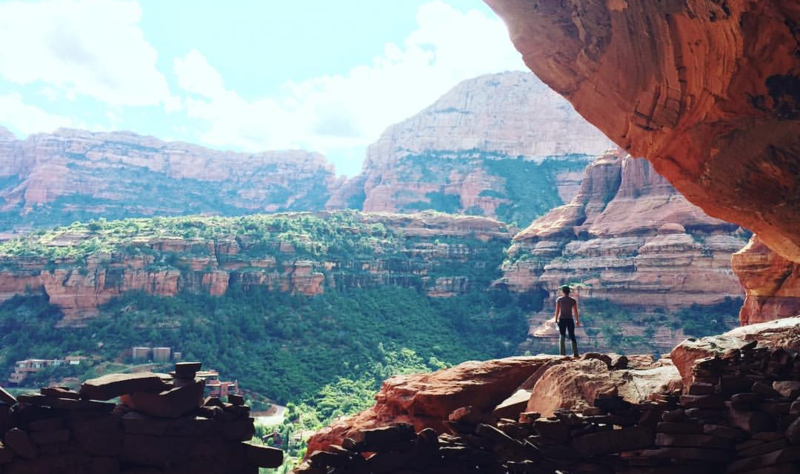 The balance is due before you arrive in Sedona. Right about the time I began production on my first back end product, I took your advice and started a platform – a weekly podcast. Once per week I sat down and took four hours to do what should’ve taken one hour – outline, script, record, edit, upload, write, and schedule an email telling my audience the broadcast was ready. I didn’t make a huge deal about getting my customers to sign up for my podcast, because I knew neither how successful it would be, or even if I would continue the podcast beyond the sales test of my first back-end product’s introduction. Still, I was able to sign up about 23% of my total customers – approximately 1800 people – to my podcast email notifications. After creating the first few episodes, my listenership declined to around 700 people. I was highly discouraged! I felt as though the market was shouting at me that they did not want my podcast! However, by the time episode 10 came around, I was back up to about 2400 listeners every week. And then came episode 14 – when I was finally ready to sell my first back end info product. This product cost $97. Let me also add that by this point in the platform journey, I was very tired of putting my podcast together. Even though I had streamlined, it still took me at least 2.5 man hours of work per week to get an episode up. I was almost hoping that the platform would not prove effective, so that I could throw in the towel and not feel bad about it! And so: I set up my big launch test. To my platform, I was going to record a special edition of the podcast that would focus on the problem that my new back end product solved, then ending the 15 minute podcast with a five-minute blurb all about the new product and how excited I was to offer it to them. Not much of a sales campaign by most Internet standards! But by this point in the journey, even if I didn’t particularly enjoy building my platform, I had enough respect for my podcast listeners to know that bombarding them with emails was simply not an option. I had talked to too many of them – they were real people whose time I respected. This audience was about 2500 people. To the remainder of my customer list – those who did NOT sign up for my platform, I planned a regular email style sales campaign. You should also know that I did nothing to keep up a relationship with this audience of non-podcast listeners. I respected their choice to not be communicated with, and I placed my faith in the hope that they would remember me and the product they originally purchased from me whenever I was ready to try to sell them something new. The size of this audience was 9600 people. I wasn’t sure what to expect: Jason, through all of your strategic coaching, and in all of our weekly pep talks, you encouraged me to keep up with building a platform saying that you were positive the platform was the surest way to guarantee successful back end sales down the road. I didn’t want to believe it – it was so much work! Products sold to the 2500 podcast listeners? 433 copies of my latest program. Product sold to the gigantic list of 9600 previous customers? 114 copies sold. Jason, I doubt I could ever express how fortunate I am that I stuck with your coaching. You are one of the absolute fewest remaining voices of wisdom repeating the mantra of one of my personal heroes, Paul Harvey: that perspiration itself… hard work… seems to be the fertilizer of success. If something sounds easy? It’s probably too good to be true. If something seems so difficult that you just want to quit week after week… that’s probably what you should be doing! Thanks again Jason. You speak the truth, and I am now $40,000 wealthier because I was humble enough to listen to you. With about 100,000 folks offering business and internet coaching, why did I choose to Jason Leister to coach me? Because out of all the people claiming to be coaches, only a handful have actually done what they are talking about. Its easy to tell people what they should be doing in their business. It’s far harder to build a business. Jason has built not one, but several working business systems. It’s the difference between knowledge and wisdom. Next, take the small handful of coaches who have actually built several online business systems and narrow it down to ones who can actually teach what they are doing. Few coaches are left standing at this point. Jason is. And finally, narrow the few coaches left down to those who have not only done, but can teach, and also realize that you are unique and need a unique solution, not just be forced into some Betty-Crocker-one-size-fits-all-mold. From my perspective, you are left with Jason Leister as your coach. Back in May, I found myself in a very strange place in my copywriting career. I was quickly gaining a reputation as one of the hottest Internet copywriters around. I had the #1 sales letter on ClickBank, I had great testimonials from high profile clients, and my conversions were averaging over 8% in tough markets. Yet, I had ZERO new clients! I was suffering from the same potentially fatal condition so many copywriters face… I sucked at selling myself. I could make clients bank accounts light up like pinball machines, but when it came to touting my own services, I was useless as an ashtray on a motorcycle. I joined Jason’s coaching program and he immediately turned my head around. We went over my process of dealing with clients and he showed me all the money I was leaving on the table. For instance, when prospects would ask for a price quote, I was doing something really dumb — GIVING IT. Without knowing anything about their business, their ultimate goals or their TRUE needs (which they typically have no clue about). Using the system Jason taught me, I quickly restructured my negotiating process, and within 4 weeks, I went from 0 new clients, to being booked 2 1/2 months in advance with 3 new clients, and one repeat client. That was pretty amazing, but even more important… clients now see me as a partner in their business, not just a copywriter filling pages with words. Even my former clients now view me with higher regard, and have no problem paying twice what they paid before. That’s because Jason taught me how to become a valuable asset to my client’s business, rather than a necessary expense. As copywriters, we don’t cost our clients money, we make them money. Helping a client make this realization is the key to a long, relaxing, and prosperous future in this business… But first you have to see it yourself. And no one will show you better, or faster, than Jason Leister.